Jinellycakes: the story of JINELLYCAKES. As a child, I always looked forward to Sunday mornings. Without fail, it was one day of the week that I would wake up to the aroma of freshly baked cake - a different one each week. My mom loved to bake and was known for the elaborate cake decorating skills and attention to detail. In addition to baking every Sunday, she would make outrageous cakes for my birthday that I always looked forward to! Throughout my childhood spent in Jamaica, we also frequented a local bakery called Sugar & Spice where I would paste my face against the glass case and stare at the cupcakes. The frosting was always Blue or Orange to coincide with the color of the establishment - mom always got me vanilla. It wasn't until my wedding day that I made a joke during my vows to learn how to cook - a vow that my husband would remind me of everyday. So what did I choose for my first experiment in the kitchen? Cupcakes! Sure it would have been nice to learn how to cook a meal, but why? With my 8 year old sister in tow, I tried my hand at baking cupcakes from scratch...and it was a disaster! Not to be defeated, I got back in kitchen and finally saw some success. 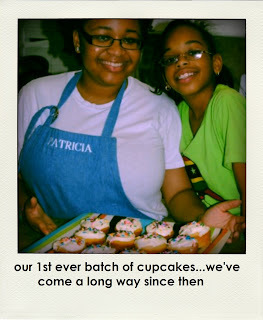 Since this day, I've been addicted to baking cupcakes and the reactions I'd get from people who ate them. I would try different recipes every couple of days and family would devour them before I knew it. Soon I started getting yelled at if people would come over and I was out of cupcakes, lol. I decided to start a little cupcake business and was able to complete a couple orders, before I started working full time and focused all my energy on that instead. Much to the dismay of my loved ones, I no longer had the time or energy to bake. A year later, I've put my company back together with more products and services - we're better than ever! The name "Jinellycakes" comes from "Jin", the name my family calls me and "Nelly", a nickname given to me by my childhood friends. On this blog I hope to share with you all the behind the scenes of Jinellycakes, updates, inspiration, hopefully some successes and who knows...maybe the road to opening up my own storefront. and i love how you can now show the haters with your skills, huh? HA! Congratulations on starting it up again! I used to love reading your blog but couldn't find it for a while, so am pretty excited about your new cupcake blog. If I lived in the USA I would totally buy your cupcakes but for now I will just have to dream.